Superfoods can be simply stated as those foods that are nutrient dense and provide several health benefits. We do not know how long we would live, but now we can surely add years to our life by making some really smart food choices. Even though there are several variables involved, by following a healthy lifestyle we can increase years to our life. These include having a well-balanced meal that may contain certain superfoods. Superfoods can be simply stated as those foods that are nutrient dense and provide several health benefits. A research published in 2009 by a team of scientists of Buck Institute discovered that whey protein is one of the most nutritious superfoods you can consume to reverse some effects of aging and improve your overall quality of health. According to the research conducted by Buck Institute Faculty Member, Dr. Pankaj Kapahi, whey protein has been shown to increase our body’s stores of an important antioxidant known as glutathione (GSH). This antioxidant helps increase the integrity of telomeres and promotes healthy aging. Researchers from the University of Alberta determined that raw organic eggs contain nine essential amino acids, six grams of very high quality proteins that you can provide to your body, choline, vitamin D and lutein, which have healthy aging properties. Eggs contain the highest concentration of biotin found in nature. These contain healthy antioxidants almost in twice quantity than found in berries that can reverse the signs of aging and improve your overall health. 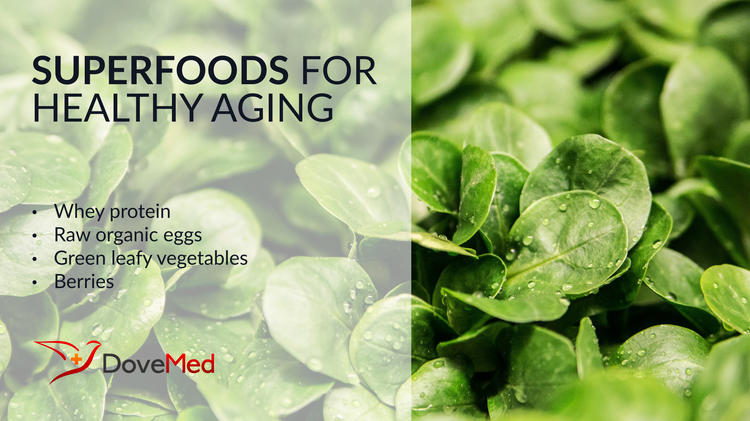 Similar to eggs, green leafy vegetables like spinach, lettuce, turnips, and kale, are rich sources of lutein and zeaxanthin. According to studies conducted by Harvard University, eating foods rich in antioxidants can considerably reduce your chances of getting age-related macular degeneration, blood and cardiovascular disorders. Leafy greens like spinach and kale are also packed with folate, which have shown to dramatically improve mental health. It has also been proved to reduce your risk of getting cancer and heart failure by slowing down DNA wear and tear. A rich source of vitamin K, green leafy vegetables are also vital for blood clotting, providing stronger bones, regulation of blood sugar level, and promoting delayed aging. A study published by Tufts University has proved that blueberries, blackberries, and acai, are an excellent source of anthocyanins which reduce stress and anxiety levels in our body, promoting healthy aging. These also aid our brain in increasing production of dopamine, a neurotransmitter that is vital for memory function, cognitive features, concentration and mood regulation. By staying active and eating a nutrient-rich diet containing many superfoods, we can not only slow the aging process, but also prevent various age-related disorders, such as heart disease, diabetes, hypertension, and osteoporosis. Agin, B., & Jegtvig, S. (2009). Superfoods for dummies. John Wiley & Sons. Shiomi, N., & Waisundara, V. (2017). Superfood and Functional Food-The Development of Superfoods and Their Roles as Medicine. Daugherty, B. (2011). Superfoods: The Healthiest Foods on the Planet. Journal of Nutrition Education and Behavior, 43(3), 207-e7. Pratt, S., & Matthews, K. (2006). Superfoods: Fourteen foods that will change your life. Random House.